Note: Legion Bug for Bears: Bear form seems to ignore the AutoUnshift settings when casting Healing Touch. Swiftmend, Rejuvenation, and Regrowth are properly restricted if AutoUnshift is disallowed. All four spells are restricted properly for Catform. Healing Touch still works properly with Predatory Swiftness. In the first case, if Maul is not ready, then the error messages will be played/displayed whenever the macro is activated. Likewise, if either trinket is not ready, the messages will be played/displayed when the second macro is used. The extra lines temporarily turn off the error sound, then turn it back on, and clear out the messages frame. Now, the error messages are hidden with regards to the secondary effects, but are still displayed when something is wrong with the primary effect (e.g. missing target, our of range, etc). The problem with this solution is that the extra commands take an extra 84 bytes of macro text. This is almost 1/3 of the allowable characters in a macro! Now the extra character count is a mere 10 characters. Also, the commands are a lot easier to remember. Turns on error sounds, and clears the errors frame. Clears the errors frame. Has no effect on sound. Will make QuietMacros print the current value of Sound_EnableErrorSpeech in the chatframe whenever QuietMacros is called. 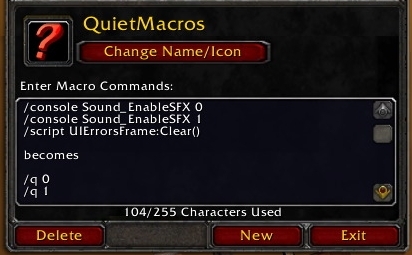 Note: /q 1 will only turn on Sound Effects or Error Sounds if QuietMacros was used to turn them off. If they were turned off another way, QuietMacros will not reactive the sound type. Most of the advice found on the web says to turn Sound_EnableSFX off and on again to eliminate the error voice. However, this setting affects more than just the error voice. For example, try flying around on a flying mount, and then type '/console Sound_EnableSFX 0' and you will find that your mount is no longer making the flapping wings sound. Another sound that will be lost will be when druids shapechange. (Type '/console Sound_EnableSFX 1' to turn the sound back on again.) By using Sound_EnableErrorSpeech, only the error speech is turned off, and so you will not have other sounds suddenly disappearing. This is particularly useful for ferals who want to cast Healing Touch when Predatory Swiftness procs, but doesn't want to accidentally go out of cat form otherwise.